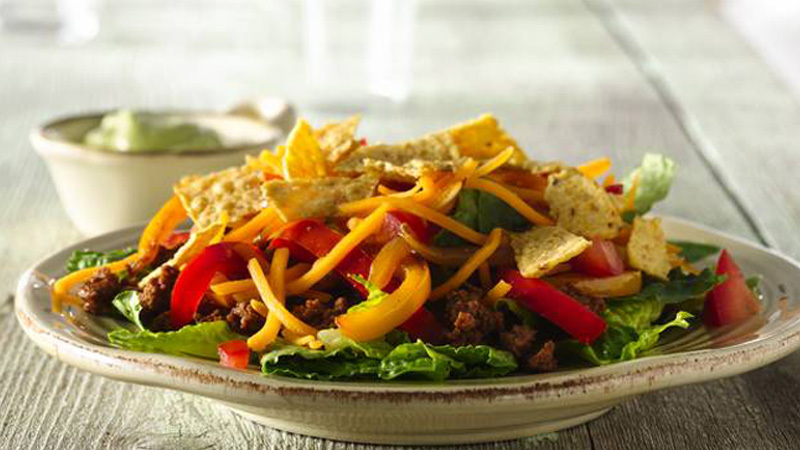 Here's a great-tasting taco salad with tons of flavour. It's worth the extra-effort to make the delicious creamy avocado dressing. 1. To make the dressing, place all the ingredients in a blender or food processor. Process for about 30 seconds or until smooth. Transfer to a small bowl, cover and chill in the refrigerator whilst making the salad. 2. To make the salad, heat half the oil in a large non-stick frying pan over a medium heat. Add the peppers and onion and cook, stirring, for 5-6 minutes until just tender. Remove and set aside. 3. Add the rest of the oil to the same pan then add the mince and fry for 5-6 minutes, stirring all the time until browned all over. Stir in the fajita seasoning mix and water and cook for a further10-15 minutes, stirring occasionally, until the beef is cooked through and most of the liquid has evaporated. 4. Divide the lettuce between 6 serving plates. Top each with some of the beef mixture, peppers and onion, tomatoes, cheese and tortilla chips. Serve with the dressing. If the dressing is too thick, thin it with a little additional milk. A ripe avocado will be relatively firm, but will give to gentle pressure when squeezed.